Can the Surface Pro 3 convince people to ditch their laptops and tablets for one device? It’s a goal that Microsoft has been pursuing since releasing the first Surface back in 2012. On Tuesday, it made its case for why the Surface Pro 3 could be both the company’s iPad killer and MacBook killer. “This is the tablet that can replace your laptop,” Panos Panay, corporate vice president with Microsoft's Surface division, said at an event in New York City. The Surface Pro 2, while generally well reviewed, did not exactly dominate the market. 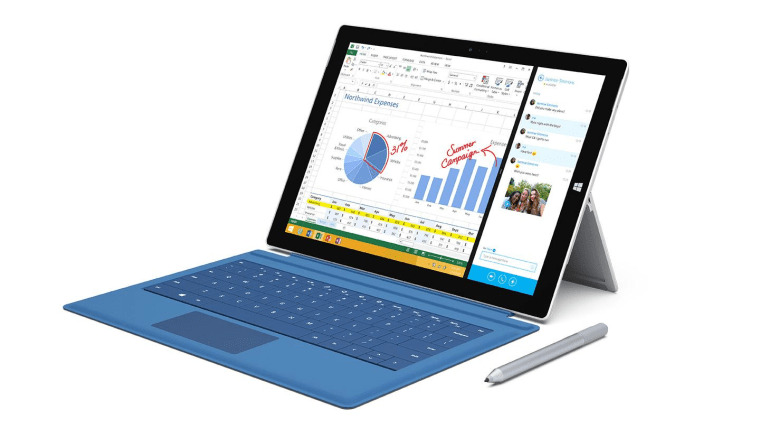 What makes the Surface Pro 3 different? A larger screen, stretching 12 inches across diagonally, as opposed to 10.6 inches. An Intel Core i7 processor. Microsoft calls it the "thinnest Core PC ever made." A slim build. It measures 9.1 millimeters thick, compared to 10.3 millimeters for the Surface Pro 2. A full-friction kickstand that supports three different angles. A new Type Cover that stays stable at "any angle," even while being balanced on a lap, something that Panay calls, for better or for worse, "lapability." A trackpad that is 68 percent larger and boasts 70 percent less friction. If true, it could fix one of the major complaints people had with previous Surface Pros. Here is what consumers will pay for "lapability": $799, plus $129 for the Track Cover.